A music server is a product that allows you to store your entire music collection and to access that music quickly and conveniently with a user-friendly interface. It is a very convenient and the fastest-growing way to enjoy your music collection. Why Store Your Music on a Music Server? Many people play the music stored on their smart phones or other MP3 players through their home music systems to achieve the convenience factors listed above. However, the poor sound quality of the MP3 files on these players seriously degrades the home listening experience compared to listening to that same music on a CD. When your music is stored on a properly-designed music server, however, you can get all of the storage and retrieval convenience of a portable player and yet have that music reproduced at a quality level that will leave you wondering how you could have ever listened to your smart phone at home. When implemented properly, a music server can provide sonic results as good as or even better than the sound heard through a high quality CD player, and you can still enjoy the convenience of your portable player when on the go. There are numerous brand name music servers available for purchase which do these tasks using built-in hardware and proprietary software to store and access your music collection. 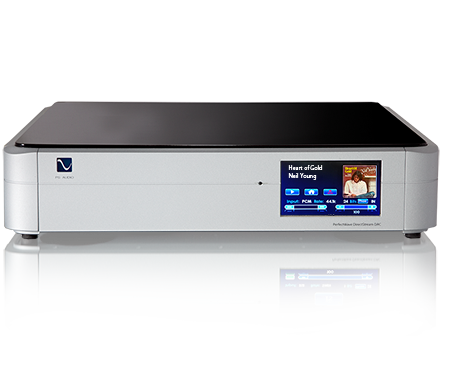 The problem with these pre-built systems is that they rarely even attempt to meet the high audio standards required for the best music reproduction and that they are specialized components which can quickly go obsolete. The companies can also go out of business, leaving you holding the bag with a server that cannot be updated or repaired. However, it is simple and straightforward to create your own music server using a standard PC or Mac computer and a device called a USB Digital-to-Audio Converter (USB DAC for short). The computer stores and accesses your music using standard programs such as iTunes. That computer is connected to the USB DAC with a standard USB cable. The USB DAC accepts the digital music data output by the computer, converts it back into analog music, and then passes that music to your stereo, home theater, or multi-room system. The computers used in such music server systems are entirely standard and can be purchased anywhere, relatively inexpensively. The USB DACs we recommend are available in a wide variety of prices and are manufactured by high-end audio companies to yield the best possible results. All of the information in the rest of this article will assume we are talking about computer/USB DAC servers, not proprietary servers. In addition, we will be glad to advise you in making this an easy, pleasant, and exciting next step in your home music system. To have your music sound its best when playing it via a music server (using a computer and USB DAC) it is important that you store your music on your hard drive in a high quality format. Storing the music as MP3 files or AAC (Apple compressed) files will result in seriously degraded sound. Nevertheless, for music that you only have available in those compressed formats, a quality USB DAC can still be a great help. The proper way to store your music is in WAV files, AIFF files (Apple uncompressed), Apple Lossless files, or FLAC files (open source lossless.) �Lossless� formats save about 50% in terms of hard drive space compared to WAV and AIFF formats. However, hard drive storage space is very cheap these days, so lossless formats are not even necessary unless your existing computer has limited hard drive space. Be it an internal or external drive, you might as well buy a lot of space and store uncompressed WAV or AIFF files. A 1 terabyte hard drive can cost well under $80 and store about 1400 CDs. If you can have this kind of space internally, fine. If you need to use an external drive, that is almost as easy. You might wish to consult with us on the best way to do that. For music management, you can use any one of several programs. iTunes is by far the most popular as it runs on both PCs and Macs. It is continuously updated and has many features that make it very user friendly. It allows you to import songs and albums from your CDs, buy music on the Internet, view cover art, and sort songs, artists, and albums in various ways. You can also burn albums, mixes, and playlists to CDs or transfer them to your smart phone for use away from home. By default, iTunes will import music from your CDs in a compressed format. The changes you should make to avoid this and to improve fidelity are as follows. Click on the iTunes menu (in upper left), Then click Preferences. Check the checkbox that says "Automatically retrieve CD track names from Internet". Most artist, album, and song names will be automatically retrieved into iTunes and associated with what you have stored. You can also use the list in this dialog to decide what happens when a CD is inserted. We like the option "Ask to import CD", but you can choose whichever option best suits your needs. Next click on Import Settings to set the quality that will be used for your imported music. Click on the up / down arrows at the end of the Import Using box. Choose AIFF Encoder or WAV Encoder for fully uncompressed storage. If you want, or need to save space you can choose the Apple Lossless Encoder with virtually no degradation of sound. Next, click the box to use �error correction." With today's computers, this will barely affect the speed of transfers but may help sound quality by improving the integrity of the data transfer. Click OK to save your Import settings. Click OK again to save all of your changes and exit back to the main iTunes window. You have now optimized iTunes for the best sound quality from your computer and USB DAC. Click the Edit menu, then click Preferences. The rest of the instructions are the same as for a Mac, listed above. Hint: If you want iTunes to download artwork for your albums automatically, open the Store tab in the Preferences and click the checkbox that says "Automatically download album artwork". You will need to set up an iTunes store account to download artwork, but the artwork is free, and you are not ever required to buy anything. Hint: WAV and AIFF both yield high quality sound, but AIFF makes it easier to import album art from the Internet if the Apple website does not have the artwork you need. Hint: Loading your own music does take time but is not at all hard. It need not be done in one session or even more then a few discs at once. You can load your collection 10 to 20 discs at a time, whenever you feel like it. Ten discs probably take about 30 to 40 minutes, and you can do other things while the disks load. There are even services that will do the work for you for a nominal charge. But, you do not want to have to do it twice. Running a RAID set up (2 drives working as twins and keeping a constant copy of the one being used) or backing your hard drive up to another drive or to an on-line service is imperative. Creating and maintaining a back up makes for such huge time savings and lack of worry in case of a hard drive failure that it is worth the initial effort 100 times over. Backing up is simple, and you can even set up your system to do it automatically on a preset schedule. As we said earlier, you can use a PC or an Apple Mac. The computer should be reasonably modern but need not be the absolute latest, greatest, or fastest. The fastest CPU is not needed for a music server. The system must be able to support USB 2.0, and all reasonably modern ones will do so. If it is a PC, it needs to be running Windows 7/8/10. Earlier Microsoft operating systems will work, but there were some operating system improvements that make Windows 7/8/10 sonically preferable. There should be at least one large, internal hard drive so you can store many CDs without compression. Alternately, If you need more music storage space than is available with your existing computer, you can get a large external hard drive and make that a dedicated music storage drive. If you go the PC route, you can use a standard mini-tower, a micro-tower, or a PC Mini or laptop for the smallest footprint. Many PCs are even available in decorator colors to match your d�cor. If you go the Mac route, there are several options. The iMacs and the Mac Minis are both very visually aesthetic and user friendly, but any Mac model can be used. A Mac Mini is only about 8" x 8" x 2" and is definitely powerful enough for a music server. Additionally, there are external hard drive housings that are made to look the same and stack on top of the computer. You could have the Mini with a music storage drive and a back up drive stacked on top and still take up only about 8" x 8" x 6" or so, aside from the monitor, keyboard, and mouse. An iMac is an all in one Apple computer and monitor which is about the same size as a small flat screen TV. The iMac also requires two external drives for storage and back up plus a keyboard and mouse. A Mac running iTunes can use the Mac remote control which comes with certain models and is also available separately. The nice thing about using this remote is the large screen graphics mode that can be enabled with the push of a button that lets you see and manipulate the album and song that is playing from across the room. An iPad, iPhone, or iTouch can also be used as a remote with a Mac and with a Bluetooth-enabled PC running iTunes. An inexpensive USB to Bluetooth adapter can be added to any PC that is not already Bluetooth-capable. By adding free Apple software called "Remote" to your iPhone or iTouch, they become full-fledged iTunes remote, and you can view and select songs and album cover art on the remote, even from other rooms. There are also alternative software products that can be used to perform the same functions with other playback software such as Windows Media player and Winamp. If you prefer, you can even set up external hard drives and use them with a PC or Mac laptop. With either a desktop or laptop, the computer's CD drive will be used to load music and play single CDs. If there is no CD drive on the computer, an external CD drive will work just as well. This is the most important part of the music server package. The quality of the USB DAC will make or break the system, and a little extra investment here pays large dividends with respect to what you will hear coming out of your speakers. Gerry worked on making a computer based music server sound as good as a high quality CD player for two years without using a USB DAC. He read, experimented, and spent money on adapters, jitter reduction devices, many types and prices of cables, etc., all to get the sound right. But it never equaled the performance of a high-end CD player. Then, along came the USB DACs, and the game changed. With these, the music emerges from the computer without ever going through the computer's sound card, a very important factor since the best of those cards does not compare well to even a basic stereo system. Once he heard what a USB DAC could do, he made the change and never looked back. There are now quite a few USB DACs out there, and we have selected brands and models which represent a wide range of prices. These include brands such as Audioquest, Pro-ject, ARCAM, PS Audio, NAD, Simaudio/MOON, and Rotel. 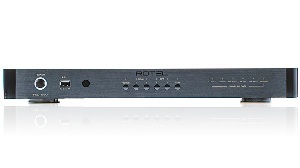 We have USB DACs starting as low as $199 with true high-end models starting at $799 (ARCAM and Rotel) and going to $15,000. 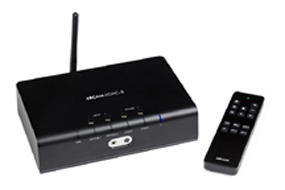 There is even a wireless version, the NAD DAC 2, which allows you to place your computer several rooms away from your music system. When you use one of the high-end models, you can connect it to an entry level quality system or an ultra-high-end audio system and always feel that you are getting the best possible sound. If the question is, �Can I put one of these with my $2000 system and really get a worthwhile performance improvement ?�, the answer is, �Yes, without question�. 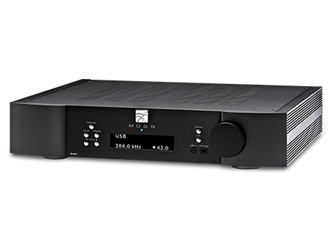 If you are asking if you can put a top-of-the-line Simaudio/MOON or other USB DAC based music server with your $40,000 stereo system and be amazed at the performance you get, the answer, again, is, �Yes". 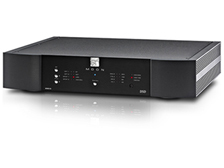 You will be thrilled at how good a properly-designed music server will sound in a quality system of virtually any price range, and you will be delighted by the convenience. An interesting new wrinkle to the USB DAC concept is that more and more components such as headpone amplifiers, integrated amplifiers, and preamplifiers are coming equipped with a USB input or have such an input available as an option. 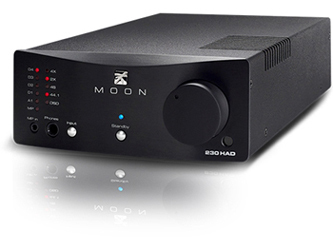 For example, the Simaudio MOON 240i integrated amplifier and the MOON 230HAT headphone amplifier come with a USB DAC. This means that these components have USB DAC capability built in, and the user can take advantage of this technology without having to purchase a separate component. A final important benefit to having a computer / USB DAC based music server in your system is that you can play Internet-based radio stations and services such as Pandora and Spotify with a much higher quality level then you would get simply by plugging your computer's audio output into your stereo. This, alone, can be a reason to make the move as it gives the user a much larger choice of stations, particularly special format stations that may not be available over the air in your area. Using a properly-designed music server (computer + USB DAC) is a great new way to enjoy your music with maximum convenience and audio quality. We at Audio Nexus are ready to help you set up and implement your own server so you can simultaneously achieve both goals.